by Ali Al Shihabi and Bernard Heykel, 2015, 218 pages. April 21, 2017, 7:30 a.m. to 9:00 a.m. The Saudi Kingdom presents a candid and insightful analysis of Saudi Arabia’s political instability in light of the mounting domestic and international challenges facing the country today. Directly addressing Saudi Arabia’s inert monarchical ruling system, its foundational alliance with the Wahhabi establishment, and its increasingly dangerous environment populated with a diverse set of enemies, Ali al Shihabi, an insider of the ruling circles and a political analyst, looks at the prospects for the survival of this opaque monarchy and suggests ideas for reform that may help it better withstand the turbulent winds of change. The book explores the history of modern Arabia, the Wahhabi ulema, the jihadi threat, and the anger of today’s youth, the mystique of state power, the Iranian rivalry, and the country’s challenges to the Gulf States. Ali Shihabi recently took early retirement from managing an investment bank he founded and now spends his time writing on his farm in Portugal. He received his B.A. in political science from Princeton University and his M.B.A. from Harvard Business School. 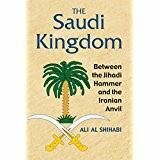 He is on Twitter @alishihabi The Saudi Kingdom is his second book, following Arabian War Games in 2012. The discussion will take place at 7:30 a.m. to 9:00 a.m. on April 21, 2017 in the E. Keyser Conference Room of Keyser Co., 4141 N. Scottsdale Road (NE corner of Scottsdale Road and Indian School Road), Suite 150, Scottsdale, AZ 85251.